Okay. I hear it, “Howard has lost his mind!” True. In the final weeks leading up to my full recovery, I realized that what was holding me back was my Adrenaline-driven mind. As much as my heart was filling up with love, compassion, joy, and gratitude, my over-thinking, self-judging, non-forgiving-of-me mind just would not let go. I knew I needed to lose it. You need to lose your mind as well. 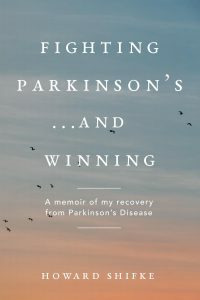 “The most difficult lesson I have learned is that I am an inadvertent participant in the emotional part of my Parkinson’s disease. What I have had to come to terms with over these last couple of weeks is that I ran from the lion for ten consecutive years and he only stopped chasing me on a rare occasion or two for very brief moments. Shortly after the lion stopped chasing me, my tremors began and my Parkinson’s symptoms became apparent and debilitating. My home life, Sally and the children, was, and is, loving and supportive. However, external factors resulted in ten years of stress filled with fear, anger, frustration and resentment. And, that is why you need to lose your mind. Think about it. In the middle of great walking for the first time in about eight months, my mind wanted to deny the reality of my physical experience of a sign of recovery. How powerful is your Adrenaline-driven mind? As you can see, mine was extremely powerful. So, I had to calm it down. I had to tell it how wrong it was. I had to be vigilant and recognize any negativity coming out of my mind. It was necessary for my recovery to lose my mind, that Adrenaline-driven-fearful-anxious-self-judging-self-criticizing-non-forgiving-angry-frustrated-worrisome-stressed-out-mind…you know, THAT ONE! My friends, it is time to join with me and others ahead of you who came to the simple realization that Dan Millman’s Socrates was correct, “Sometimes you have to lose your mind before you come to your senses.” And when you lose your mind and come to your senses, you experience life from your heart and with your senses. You feel love, gratitude, compassion, forgiveness, joyfulness, happiness, and contentment. You experience life from your senses: seeing, feeling, hearing, smelling, tasting. And it all rises up from deep inside you, a sense, a feeling, an essence you cannot describe, but you know it is there. That is what is real, and losing your mind gets you there. I know you can do this. Grab onto the Parkinson’s Recipe for Recovery®, and start losing your mind! I couldn’t agree more, Howard, I need to let go of the adrenaline addicted mind. I used to tell people that I was running on adrenaline. Meditation is so important because then we have a chance to quiet the mind, reach for joy and then focus on how it would feel when we are well. Thanks for the reminder! Much love to all. Thank you, Howard, for the example of the grocery cart taking off with your confident strides! Our beliefs that our egos hold on to are so powerful that they rule our lives. You show from that example that by being aware and noticing, you were able to master the ego in that moment. That is huge. Mostly we just move through our days on auto pilot and let the ego run our lives instead of the heart and soul. We see from your example that we can change that. What wonderful encouragement! Exactly right, Rita. That IS huge. That’s exactly where I am right now – trying to give my heart and soul permission to run the show. It’s mighty tough. That’s why it is great to have a coach like Howard and wonderful people like you helping to sound the charge! I thank you for all the great help you give us all and for lighting up the way! Oh Howard…what a delightful invitation! Now I just need to remind myself to lose my mind more consistently than I’ve been doing (and I must be doing okay because my doctor said he was “very pleased” with my progress when I saw him last week! )..so I’m celebrating and so very happy you are my coach…thank you dear soul! Thank you for this important reminder. I often get wrapped up in the adrenaline rush that comes from a hard work out and push myself too hard. Since finally including your recipe into my daily schedule, I am starting to learn of the healing that happens in the quiet moments when I actually do lose my mind. I am feeling and appreciating the calmness and tranquility that the meditation and chantings bring. I believe healing is happening even if I can’t see it yet and look forward to my shopping cart moment as well. I love this, Lisa! From now on, only shopping cart moments! Thanks for the post, Howard. Take the mind out of the loop, and it collapses. This opens up room for living life from a positive, compassionate and joyfull viewpoint that can lead to powerful positive feedback loops! I am losing my mind in The Netherlands.